The Bell Tower Loft is accepting bookings again after an extended stay lasting over a year. The Bell Tower Loft was completed in 2010. Like it's sister Loft next door, it is full of original details combined with modern design features. Throughout the space the commitment to preserve the past is evident. Great care has been taken to accentuate the original craftsmanship while attending to the needs of modern life. The stained glass creates a welcoming allure of light in different combinations throughout the day making the Bell Tower Loft ideal for entertaining or just relaxing with a book.There are two bedrooms and two baths - both beds are queen. The first floor bathroom has a walk-in tile shower, the top floor bath has a large cast-iron tub. The Loft is fully equipped for cooking and stocked with the comforts of home. 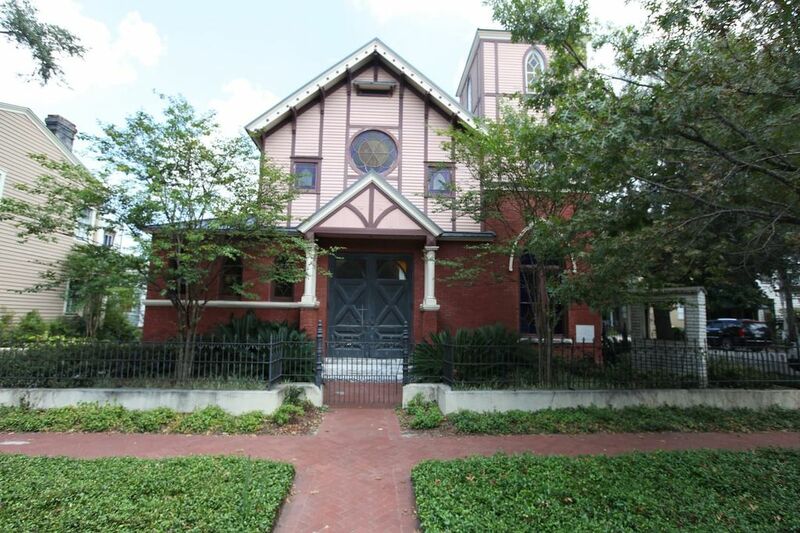 Great location 1.5 blocks from Forsyth Park. ALSO AT THIS LOCATION: HomeAway Listing #363126. Built in 1889 as St Paul's Episcopal Church by architect Eric Eichberg, this historic property hosted varied congregations over the past century before falling into disrepair around 2002. Restoration began in 2005 and the MIddle Loft was completed along with the exterior in 2008 and the Bell Tower loft in 2010. The exterior sides, covered with stucco, were refitted with cyprus siding. The original vintage pine was reclaimed from the roof and sides to be used for the interior construction. The flying buttresses and bell-tower, both missing for decades, were reconstructed from historic photographs. About 50% of the stained glass was replaced with restoration glass, the surviving memorials were restored where possible. The interior was designed to flow upward and outward providing different vantage-points to view the original details. The original ceiling and support columns provided the framework for a minimalist design concept - further accentuating the remarkable Victorian era craftsmanship. The stained glass combine with amazing results to create a surprising amount of warmth for such a large volume of space. The juxtaposition of the old and new creates a comfortable balance, giving the Loft the true feel of a home. 7' table seats 6. Kitchen bar seats 4. We stayed with another couple and we all loved the uniqueness and the convenient location. Very roomy and Kevin was attentive to our needs. If we visit in the future, we would definitely stay again. I felt like a medieval king. The high ceilings give the place and impressive atmosphere. Staying here helped me with my engagement proposal. She said yes. Service was prompt and phenomenal. Parking is included. Words really aren't enough to describe how much we enjoyed this special rental during the Christmas holidays. It was our first time staying in this rental as we have visited Savannah many times, but we have faithfully stayed in one of two rentals we always choose. We decided on this rental this particular year to try something different, and boy was it a good choice! The fact that this rental is basically a church that has been remodeled into a condo unit makes this rental unique and in a class all its own. The stained glass windows and all the architecture inside made it a wonderful place to come into each day. We stayed an entire week. My wife was worried coming for Christmas because we left extended family and all of our beautiful Christmas décor back at home, but we were delightfully surprised to walk in and find the place already so beautifully decorated with Christmas garland and lights. Fresh Poinsettas were artfully placed throughout the rental, and a beautifully lit Christmas tree sat in the living area. The owner also left a bottle of wine for my wife and I to enjoy while there. We were there with our 2 teenagers. They both slept in the loft area comfortably (we brought an air mattress for an extra bed), and we slept in the downstairs room with pocket doors. I will say the upstairs bed is definitely the more comfortable of the two! This property is so picturesque, and it is a nice easy walk to restaurants and coffee shops, and River Street is a nice, half hour walk through beautiful historic Savannah. By the way, check out Sandfly for some awesome BBQ. It is literally one block away, and you can see it just up the street. Foxy Loxy is a few blocks away, and they have an awesome cup of coffee or light breakfast fare when you're hungry. Kevin, the owner, also stopped by to make sure we were comfortable and didn't need anything. He was very personable and warm; a nice addition to the holidays. We will definitely stay here again. We were very impressed with the Loft and and the location. Kevin was extremely helpful and available immediately when we had minor issues. Savannah is so beautiful and staying at the Front Loft at Sanctuary Place made our celebration perfect! The property was amazing and comfortable. The caretakers were attentive and easy street parking. Downside on the edge of questionable area and a bit further from the tourist areas than expected although the walk was enjoyable. This location, just off the southend of Forsyth Park has a lot of advantages. The first being the park itself: 10 acres of green-space lined with 200 year old, moss covered trees. 2 large playgrounds, tennis and basket ball courts and a large amphitheater with a cafe. The park serves as a center piece for downtown life and acts as a gateway to the historic squares that make up downtown. The farmers market is every Saturday and the park host many events throughout the year. Several local favorites on this end of the park too including the Sentient Bean Cafe and Brighter Day Grocery - 2 indispensable places for many downtown residents. A free shuttle to downtown proper is just a couple of blocks over on Bull St, the trolley stop is also super close.